We currently offer a Plethysmograph (PPG) Model 76604A-5L with an adaptor (Model 76604ADP) to measure finger pulse and blood volume, Activity Sensor Model 76879S to measure any movement by the subject to help identify countermeasures. A total of seven channels can be recorded at one time. Charts are recorded in much the same manner as conventional polygraph instrumentation with a smooth scrolling display moving from right to left. The tracings recorded are in real-time and are truly rectilinear, so charts can be easily interpreted. See polygraph software page for a sample of the tracings. The system can be operated using a mouse / pointing device or the keyboard. There are limited quantities of LX4000 units available; we recommend considering the LX5000 or LX6 systems instead. Visit our Polygraph comparison sheet for more information about each of our systems. Lafayette Drug Reference written by Dr. Catherine B. Wilmore, Ph.D., Department of Pharmaceutical Sciences, University of Maryland at Baltimore. Our new USB Interface enables the LX4000 to communicate with virtually any Windows based PC computer. The LX4000 is Small and Compact, making transporting it even easier. The Redesigned EDA Circuit has a greater operating range, increased sensitivity and subject isolation. This PLE/PPG Adaptor is required for using the 76604A-5L with an LX4000 System. Protective Pouch for storing and carrying the Lafayette Instrument Company LX4000 Computerized Polygraph System DAS Instrument. Specially designed chair for examiners who travel or perform tests "in the field." 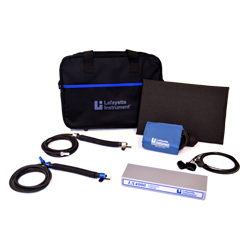 LX4000 Polygraph that includes a Polygraph DAS, Laptop, LXSoftware, Pneumo Assemblies, Cardio Cuff, Pump Bulb, EDA Assembly, Activity Sensor, and all necessary cabling.